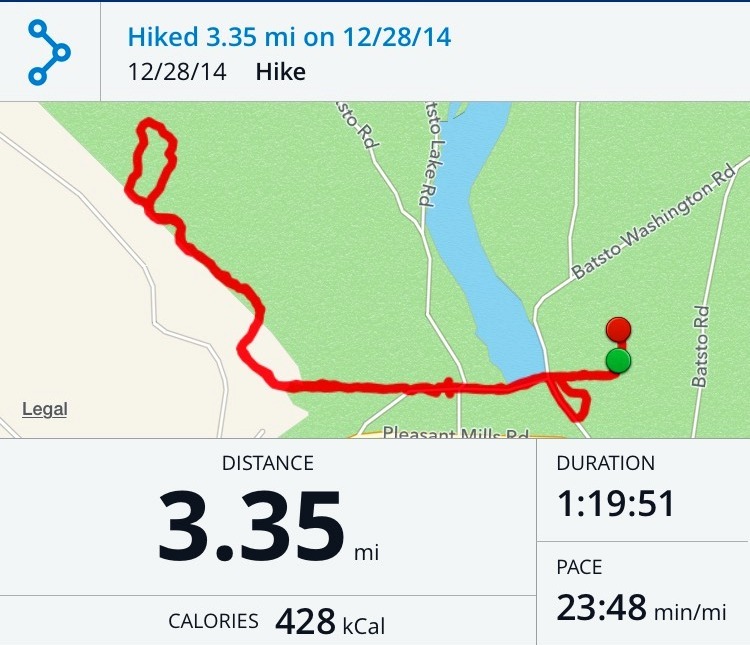 While camping at Eagles Peak Campground, we decided to do a local hike. 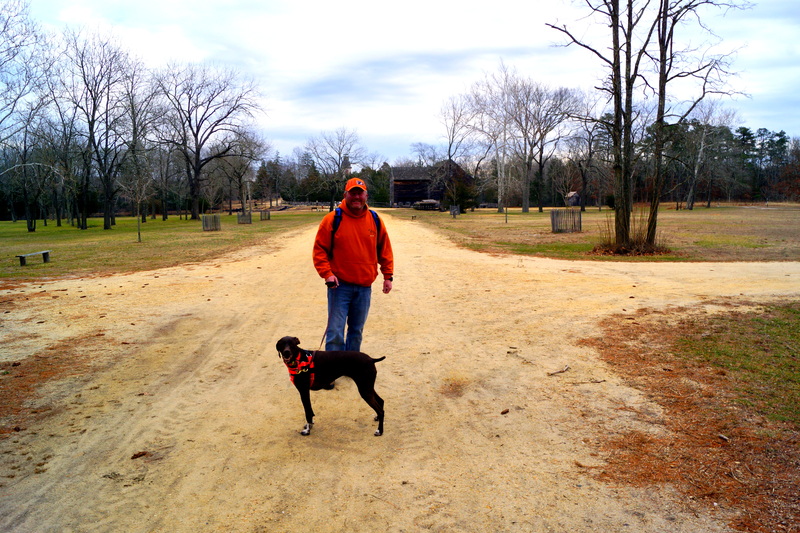 We ended up at Nolde Forest State Park – a gorgeous sate park with more than 665 acres of beautiful woodlands. What a beautiful place to hike! 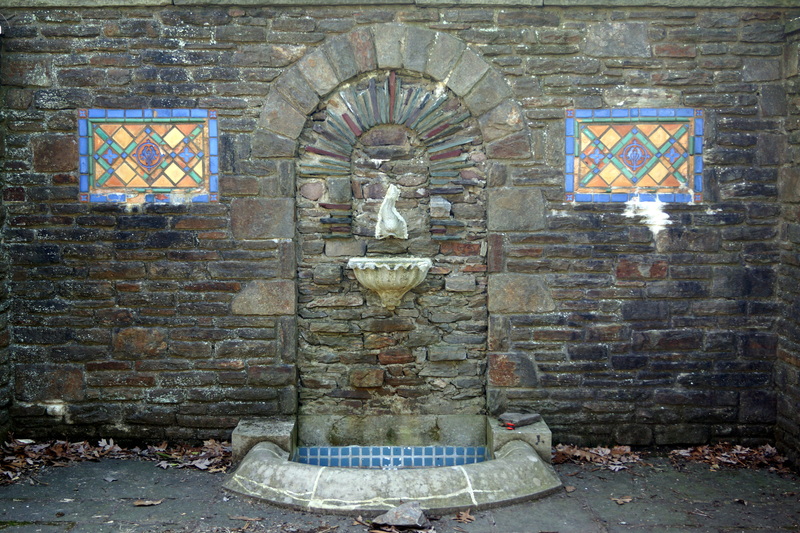 This area was acquired by Jacob Nolde in the early 1900s. As the story goes, a single white pine grew in a meadow. Inspired by this tree, Jacob Nolde hired an Austrian forester to create a coniferous forest. As the trees grew, they formed a this magnificent forest! There was a pretty stream running through most of our hike. 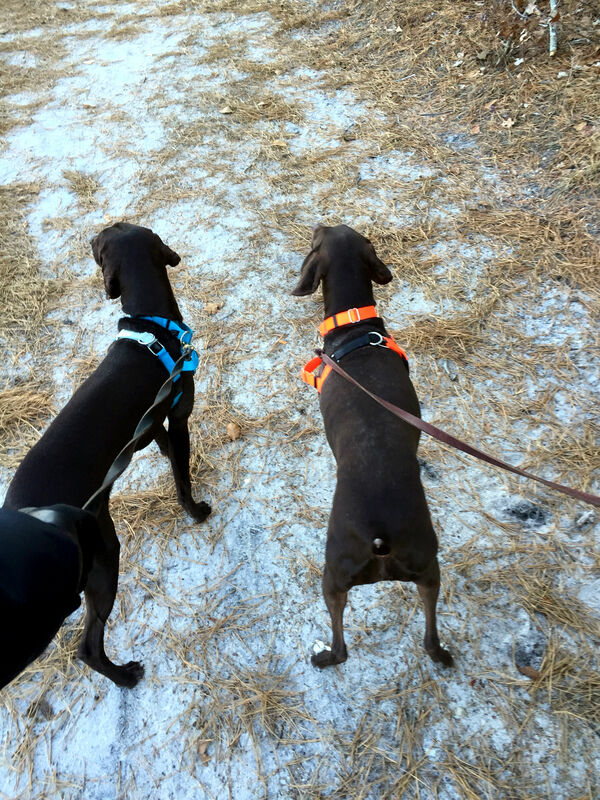 Cello and Hooch were excited to be on this adventure! Throughout the hike, there were many unique stone bridges and lined walkways. 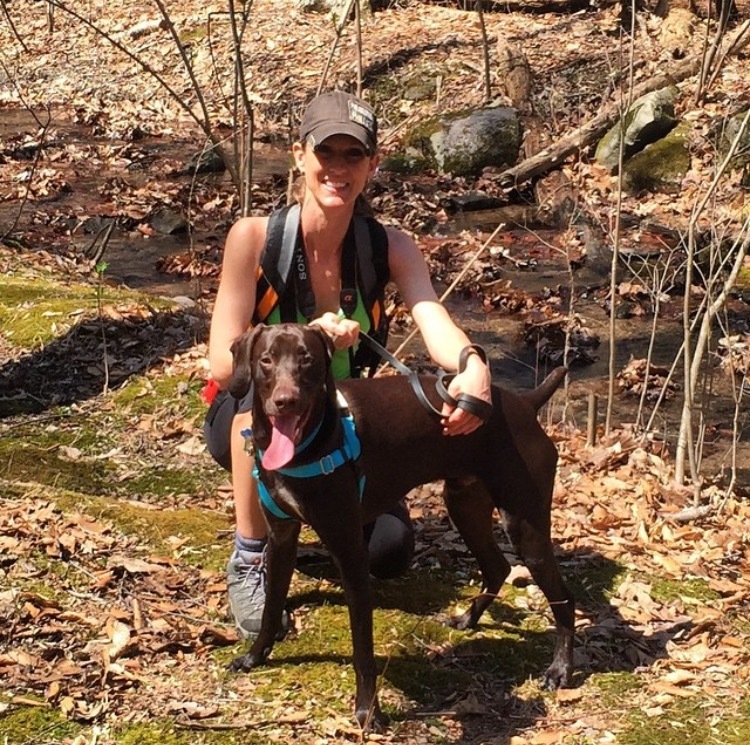 This was Hooch’s first Pennsylvania hike – and first hike in the warmer weather. 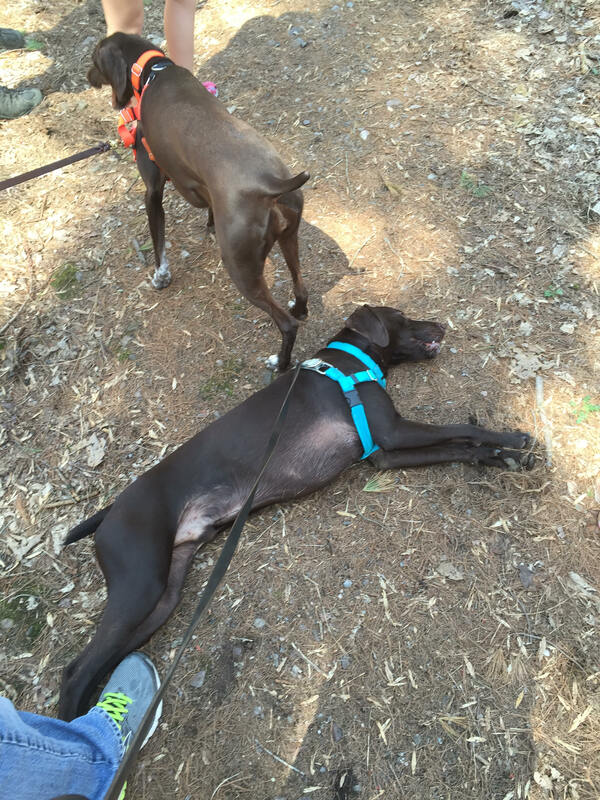 He was getting tired quickly, and began to stop in the shady areas for a breather! 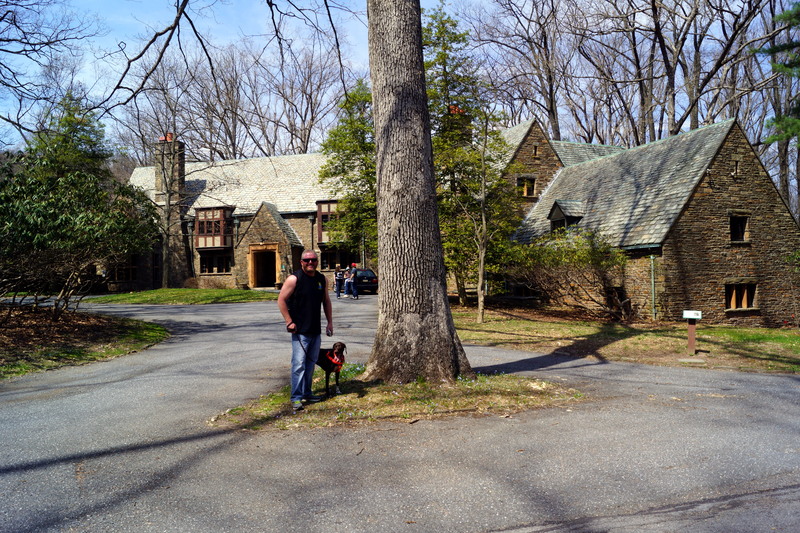 At the end of the hike, we were rewarded with the beauty of an early 1920’s mansion. 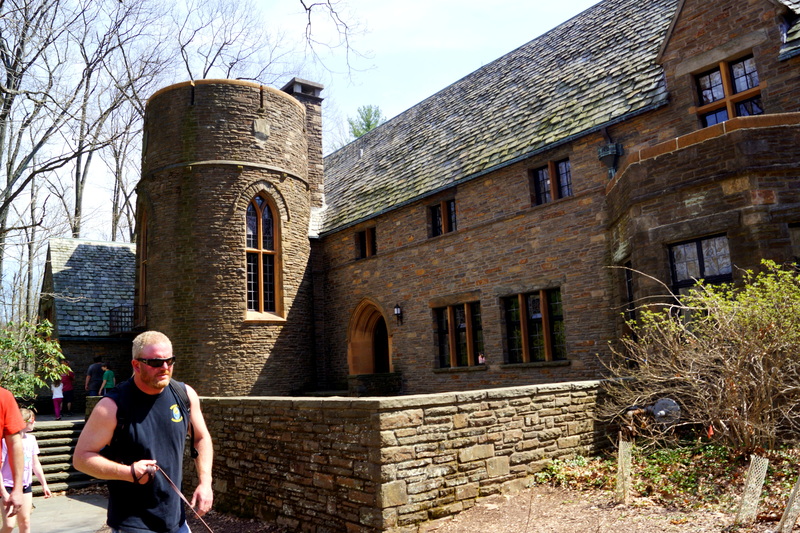 In 1926, Hans Nolde, a son of Jacob, began work on the Tudor-style mansion that sits on the property. Today, visitors can tour the grounds as well as the inside of this mansion. The garden area of the mansion was incredible! 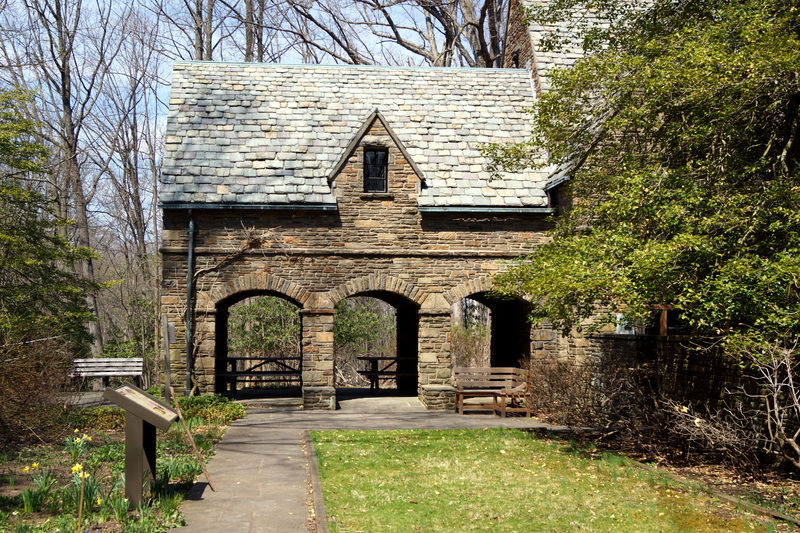 Pennsylvania purchased the property in the late 1960s , and in 1970, Nolde Forest was established as the first environmental education center operated by the Bureau of State Parks. 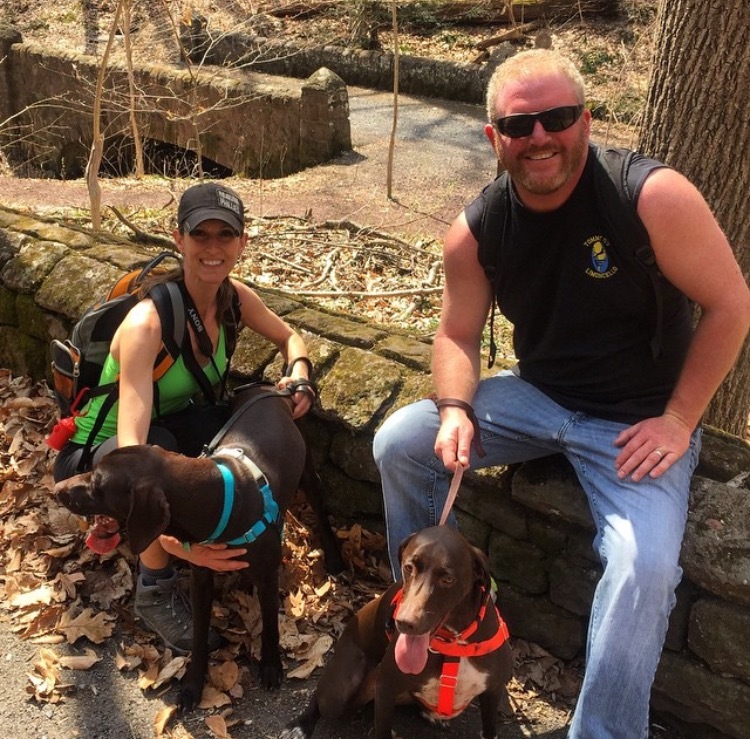 Now operated by the Pennsylvania Department of Conservation and Natural Resources, and Bureau of State Parks, the park provides a wide variety of programs for students, teachers, and adult groups. Teaching stations offer places for students to work, and benches for those who wish to sit and enjoy nature. 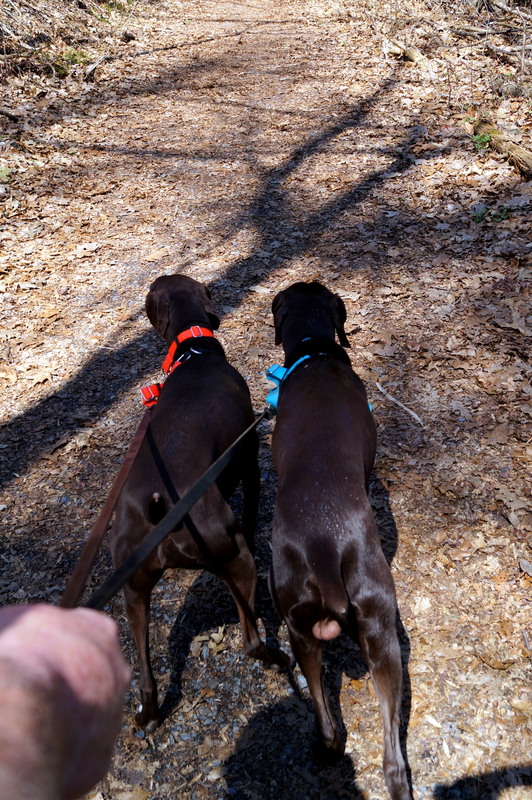 “Double Trouble,”…What an appropriately named destination for our two Hooligans’ first hike of 2015 ! There are conflicting stories about how this area got its name. The most common legend focuses on the dam at Cedar Creek. Sawmill operator, Thomas Potter, may have “coined” the words “Double Trouble” after heavy Spring rains washed out the dam twice in the 1770’s. Welcome to Double Trouble State Park! 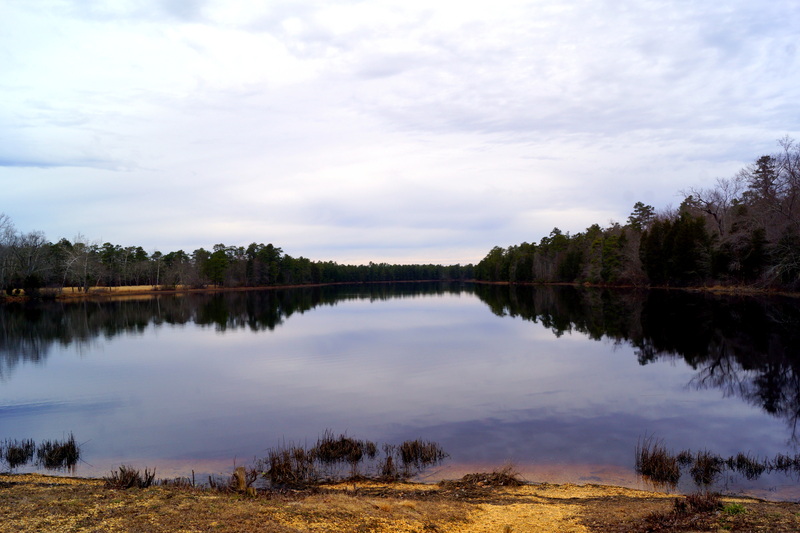 Located on the eastern edge of the New Jersey Pine Barrens, and encompassing over 200 acres, Double Trouble State Park provides a fine example of a typical Pine Barrens community centered around the logging industry and cranberry agriculture. 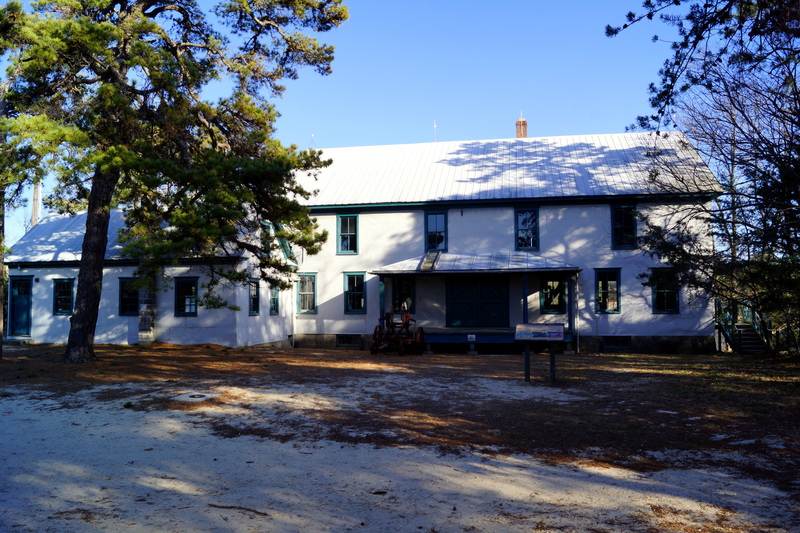 Isolated Pine Barrens communities such as this one (and Batsto) were built to be entirely self-sufficient, and their survival depended 100% on the success of the particular industry the community was built around. 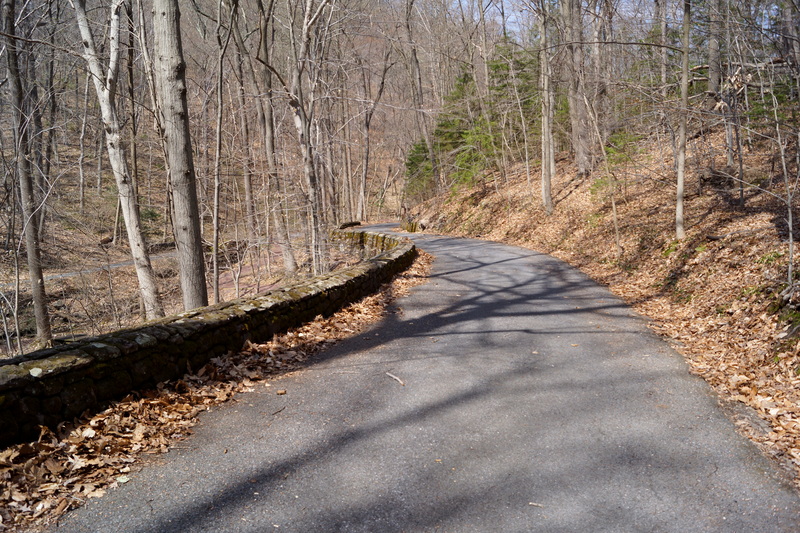 This area has a natural cedar forest, and stream, which provided both raw materials and water power for a substantial lumber industry from the 1700’s to the 1900’s. 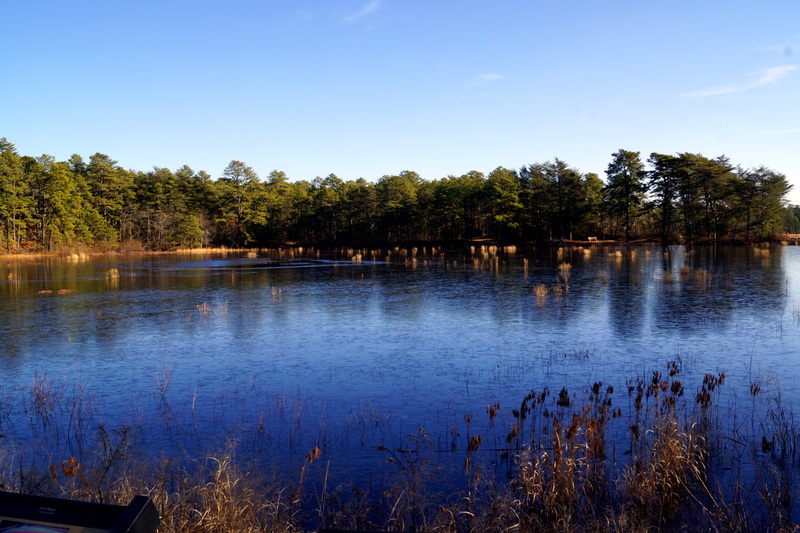 As workers cut down the timber, the cleared cedar swamps created a bog environment – perfect for growing cranberries. 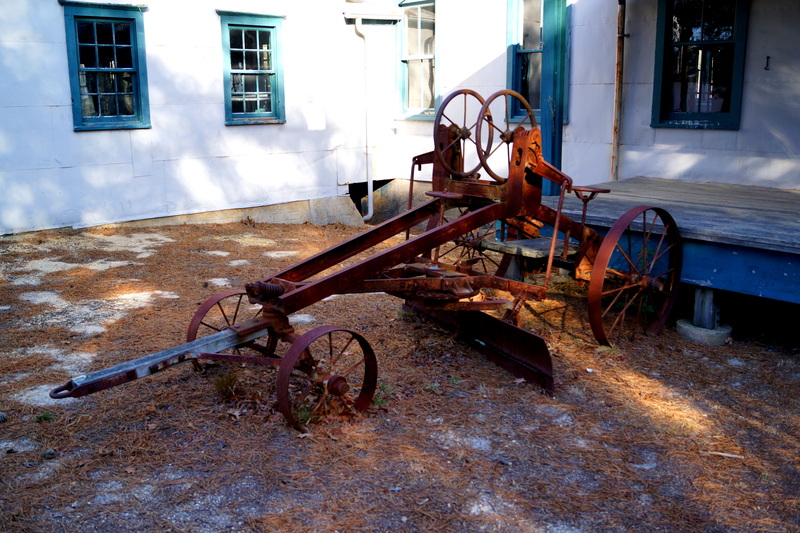 Cranberry culture began at Double Trouble Village in the 1860’s. By the 20th century, the Double Trouble Company was one of the largest cranberry operations in the state. Did you know that today, with approximately 3,600 acres of cranberry farms, New Jersey is currently the third largest cranberry producing state in the United States? 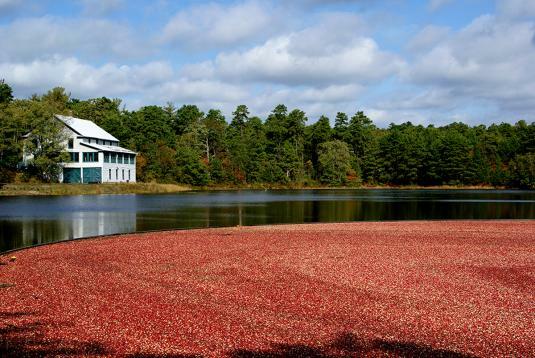 Cranberries in our parts are known as the “Jewel of the Pine Barrens! !” Interestingly, New Jersey’s leading cranberry farmer, William S. Haines, is located in Cello and Hooch’s birth-town of Chatsworth, NJ! 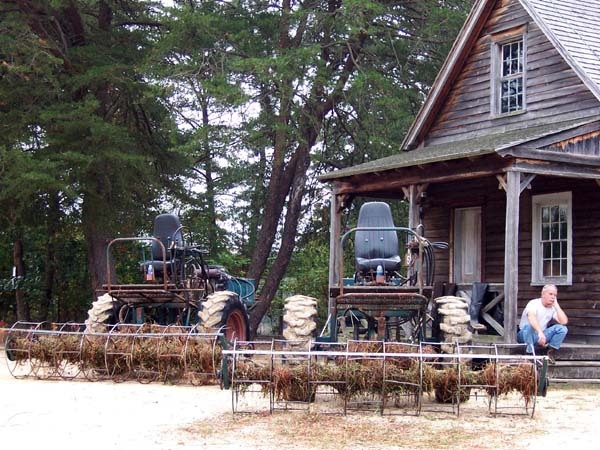 Haines has over 700 acres of cranberries on his Chatsworth Pine Island Company Cranberry Farm, and his family’s history of cranberry cultivation dates back to 1895. Cello and Hooch’s birth-town also is also home to both an Ocean Spray juice company plant (one of the leading cranberry juice companies), and one of New Jersey’s largest festivals… The Cranberry Festival, a celebration of New Jersey’s cranberry harvest, offering a tribute to the Pine Barrens and its local culture. There is a huge, diverse presentation of local artists, craftsmen, and wineries – some offering demonstrations, and all providing items for sale. And of course… there’s “everything cranberry,” including cranberry jam, jelly, chutney, ice cream, cranberry wine! 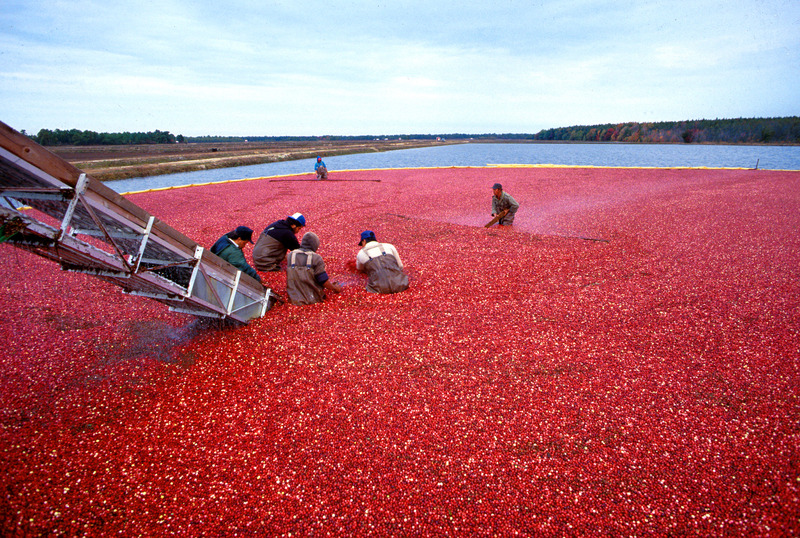 Ever wonder how Cranberries are harvested? It’s really pretty cool…First, Cranberries grow in the bed of a bog. Cranberries have pockets of air inside them. Because of this, cranberries float in water. When the cranberries are ready for harvesting, the bogs are flooded to dislodge the fruit from the vines. Water reels, nicknamed “egg-beaters” are used to “stir-up” the water in the bogs. When the water is stirred, the cranberries disconnect from the vine, and float to the surface of the water! 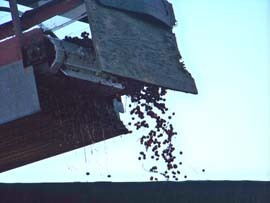 Wooden or plastic “booms” are used to round-up the berries, which are then lifted by conveyor, or pumped into a truck to be taken to a receiving station to be cleaned and processed. 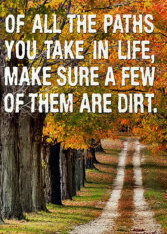 Pretty neat, huh?! 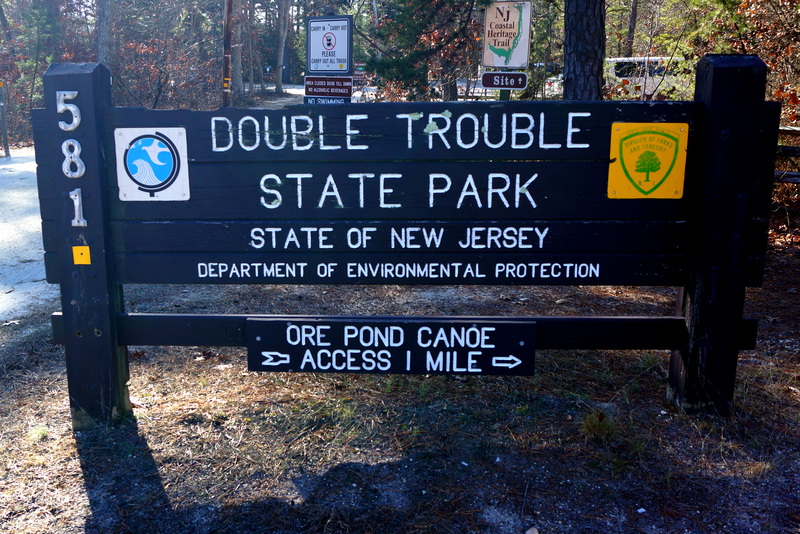 Double Trouble State Park is also listed on Weird NJ for an unusual and explainable event that occurred here! The pictures below captured this “weird” event. 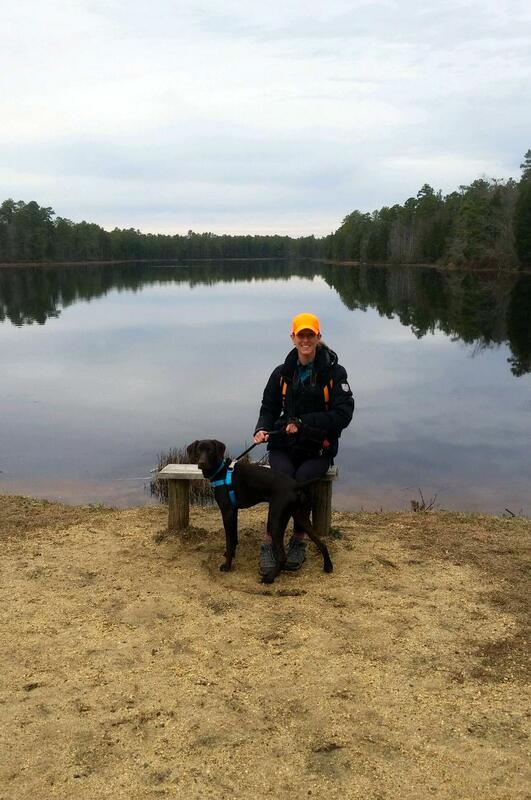 The water in Double Trouble State Park is “tea” colored, and known as “cedar water” – just like the lake Cello and Hooch live on – and most lakes in the Pine Barren area. This coloring is caused by the tannic acids found in the Atlantic White Cedar trees (which is what our log home is made of) — as well as the naturally occurring iron in the water. 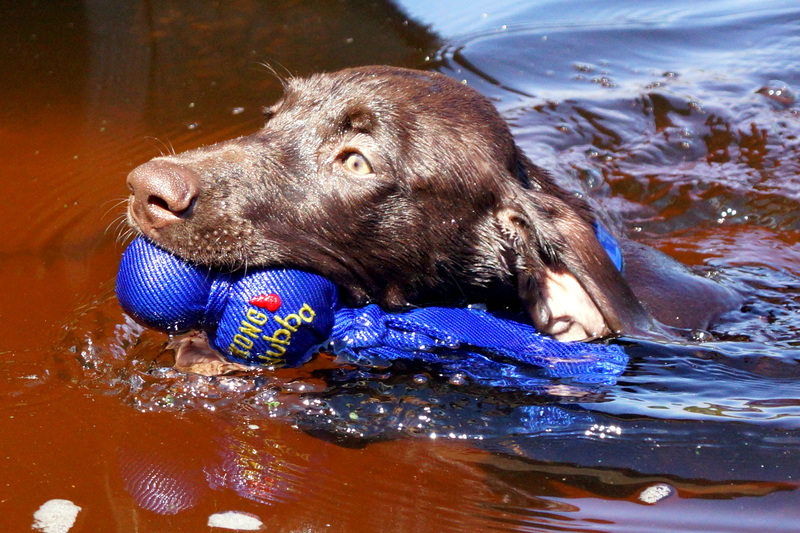 Here is a picture of Hooch swimming in our lake this past summer. You can see the color of the “cedar water” in our lake. 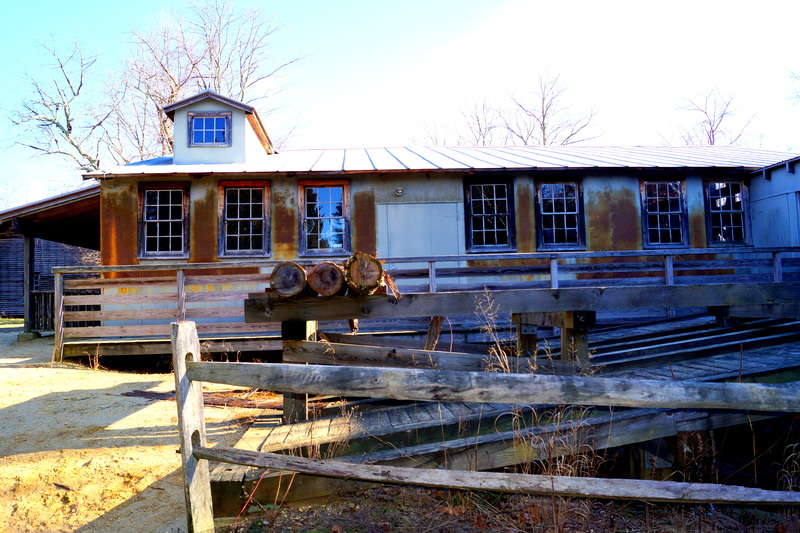 Double Trouble Village has a restored sawmill and cranberry sorting / packing house, both containing working operational equipment. 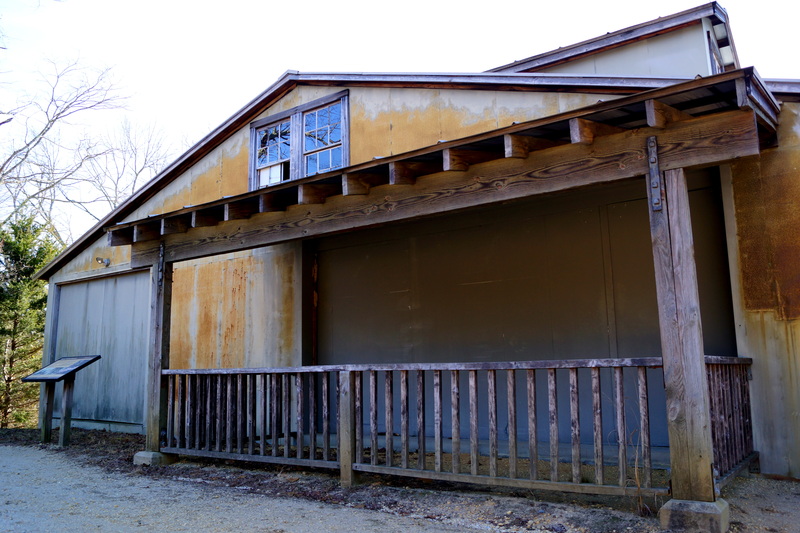 These two buildings were the focus of the village, which also includes a late 19th century one room schoolhouse, general store, bunk house, cook house, shower house, maintenance shop, pickers’ cottages and the foreman’s house. Most buildings are not restored, and look to be left “as is” on the inside (peek inside windows of the buildings while you are here!!) and only the sawmill and cranberry packing house are restored, and open to the public, exclusively during guided tours. 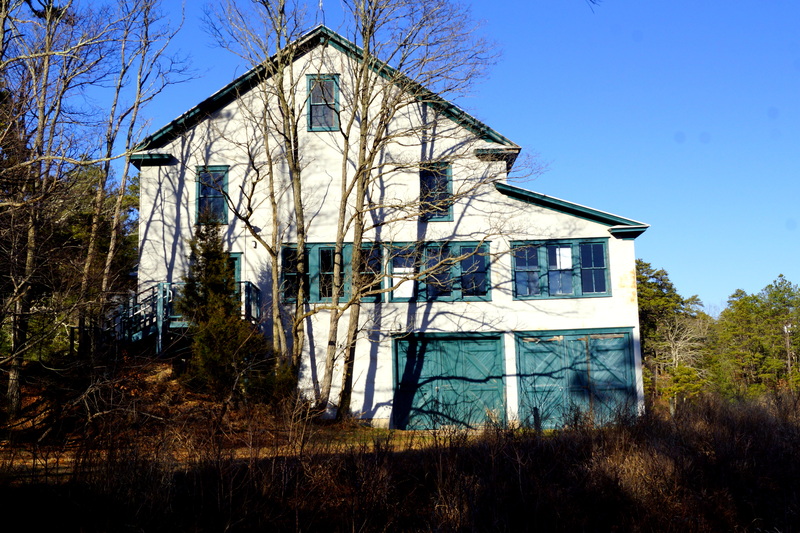 Double Trouble Village was purchased by the State of New Jersey in 1964 to help protect the Cedar Creek watershed. Double Trouble was placed on the State Register of Historic Places in 1977, and on the National Register in 1978. 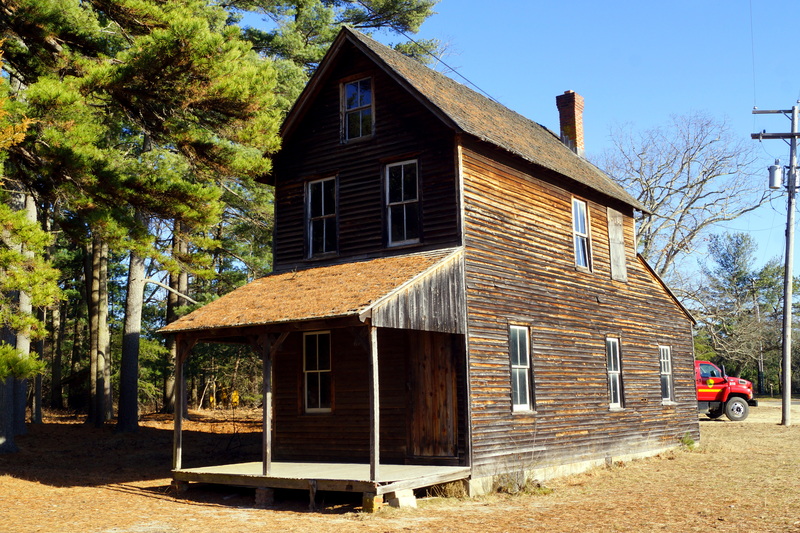 Operated from approximately 1893-1915, this one-room school is the oldest remaining structure in the village. If you peek in the windows, you can see the old school desks inside. This was the home of the Burke family from 1938 until 1957. Mr. David Burke was foreman of the cranberry processing operations until 1967.
and then packed the berries to be transported to a market. sugar. From the 1930’s until it closed, convenience items like candy, cigarettes and gloves were sold here also. (circa 1906-1909) The sawmill produced lumber, shingles and other products for sale and for use in the village and cranberry operations. (circa 1900) This was the seasonal home of the migrant workers’ foreman. 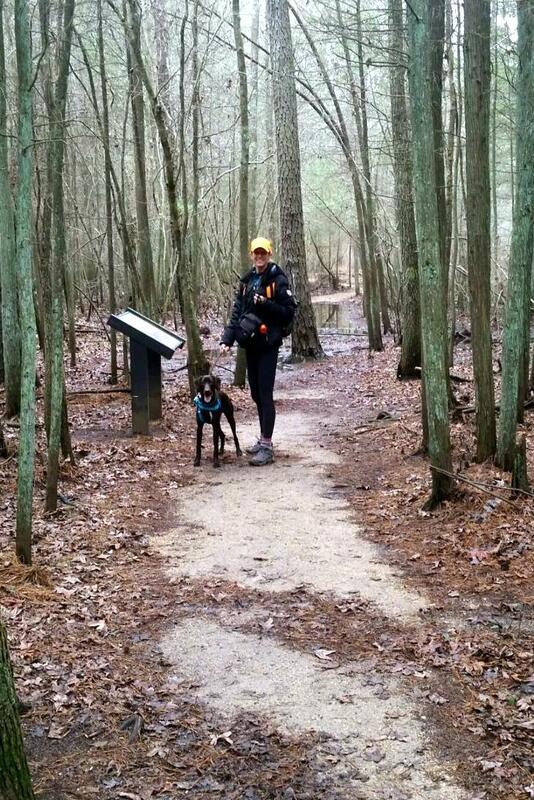 There are several different trails you can take in Double Trouble State Park. 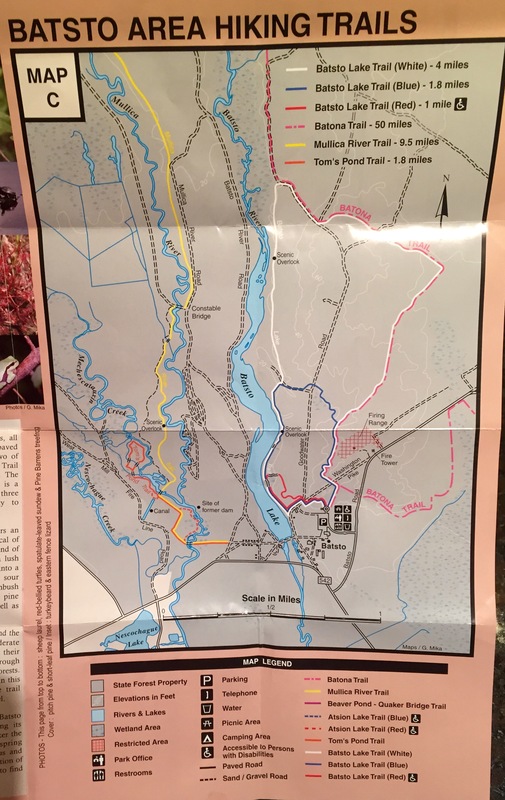 Trail Guides are available at the trail heads, so that you have a printed map and description of the trail to carry with you. 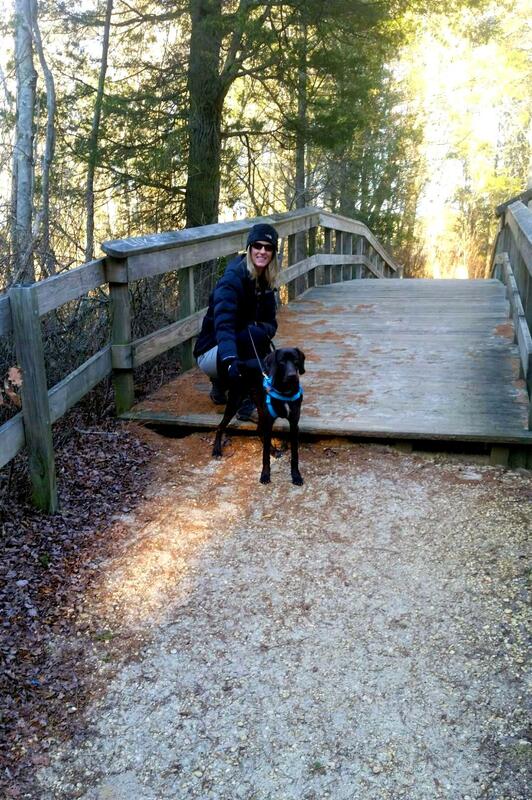 After exploring the village, we chose the Nature Trail. 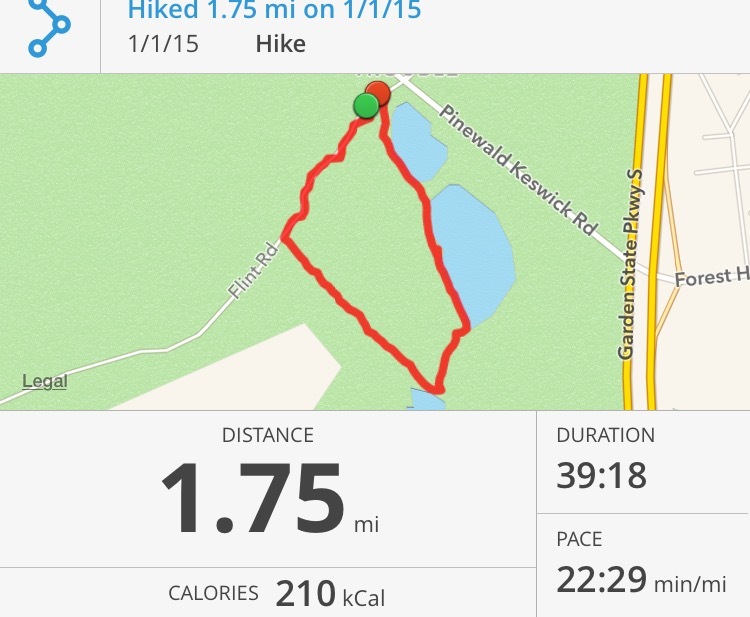 This was not the longest of trails, but considering the weather was pretty chilly, we were content with our choice. 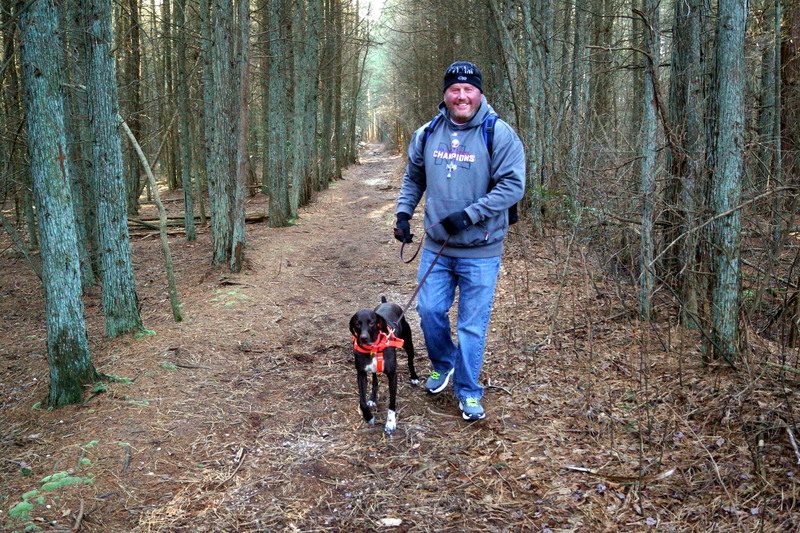 The Nature Trail passes along a couple of cranberry bogs, crosses over Cedar Creek, and passes through a cedar forest, as well as a peat bog. 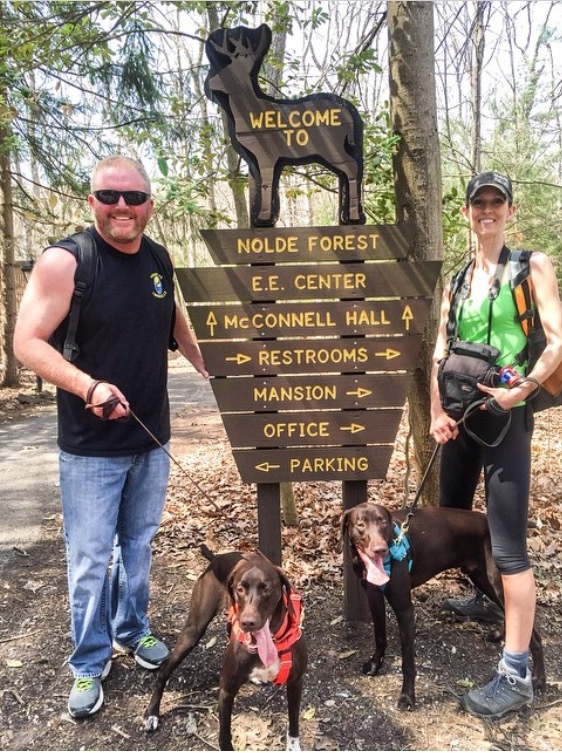 Parts of the park are open for hunting, so be sure to check with the park office, and/or NJ’s Division of Fish and Wildlife to educate yourself on any hunting activity before you begin your adventure. In addition to hiking, visitors can canoe or kayak their way through the park, using several access points on Cedar Creek. 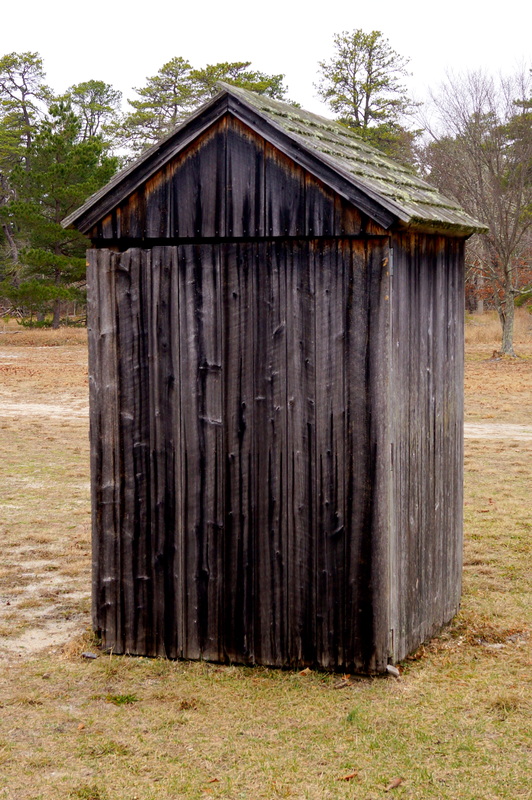 There are also public bathrooms and an Information Center conveniently located in the Pickers’ Cottage (circa 1940), just beyond the parking lot. 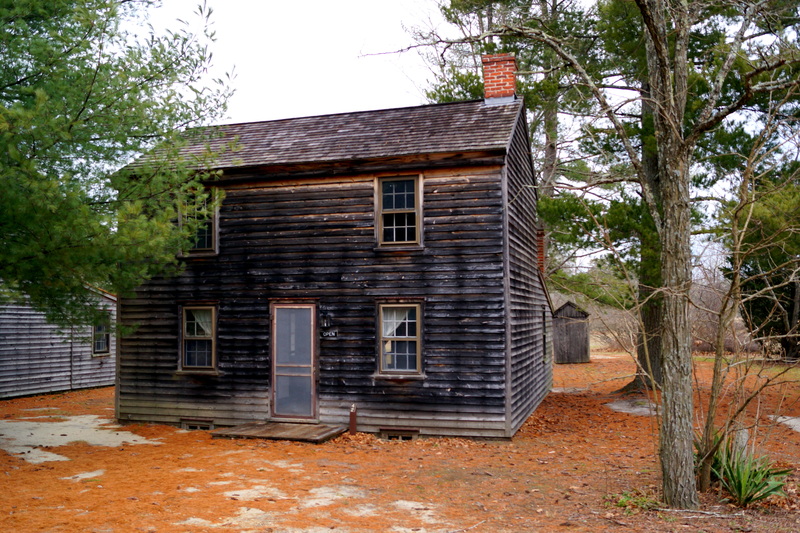 Pickers’ cottages in the village housed seasonal workers – including family groups. 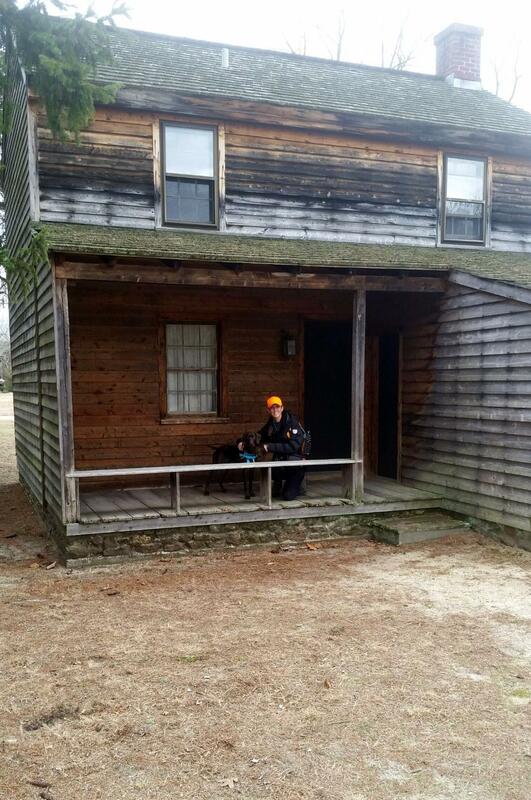 Every year 30-40 migrant workers arrived on Labor Day weekend, and lived in the cottages until Thanksgiving. 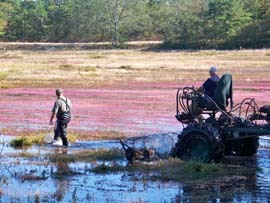 These village employees worked solely in the bogs, hand-picking the cranberries. 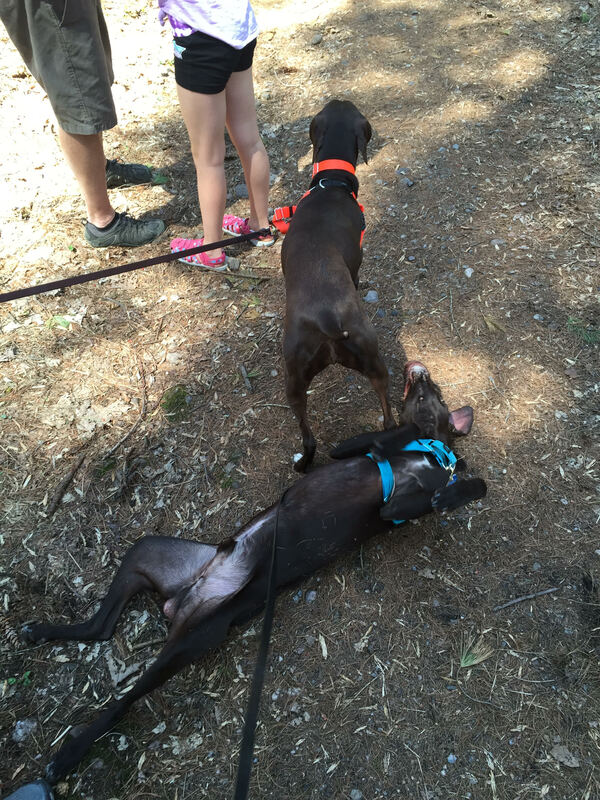 As you can see, we all very much enjoyed the abundant history and unique sights of Cello and Hooch’s first hike of 2015. 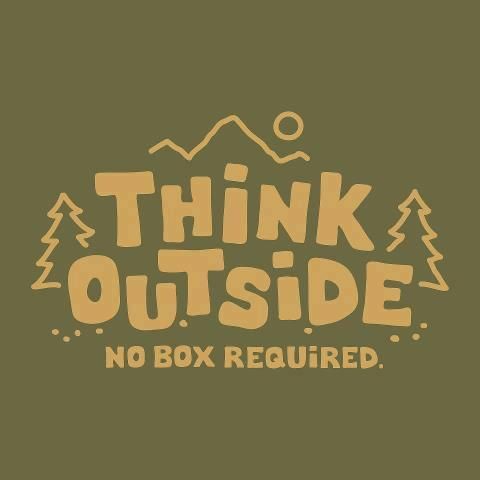 What will be YOUR first hike of the year? 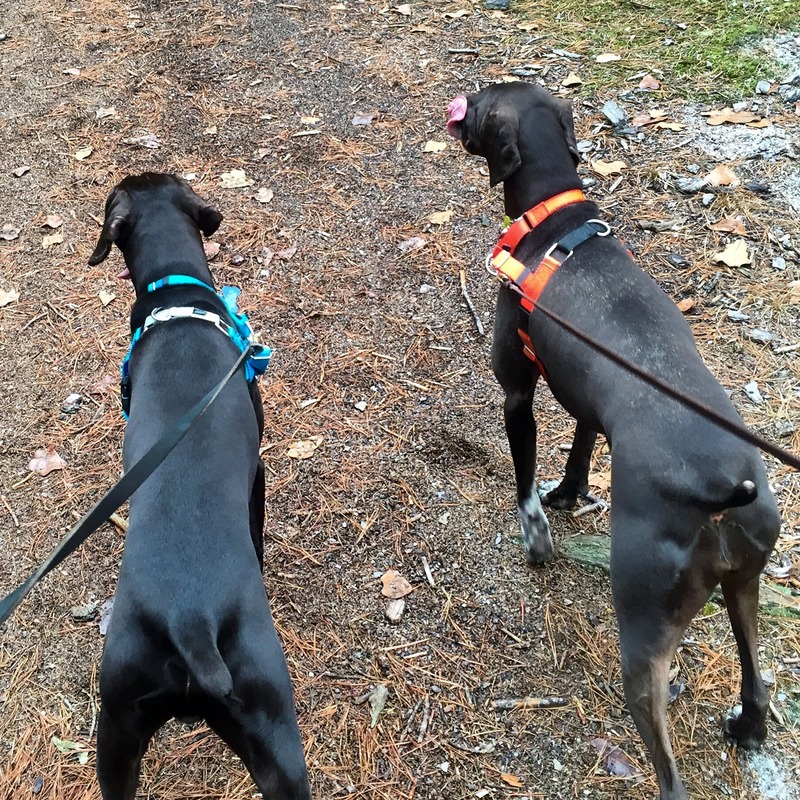 Cello and Hooch would love to know…go on, now… TAKE A HIKE! It’s the Friday Pet Parade! 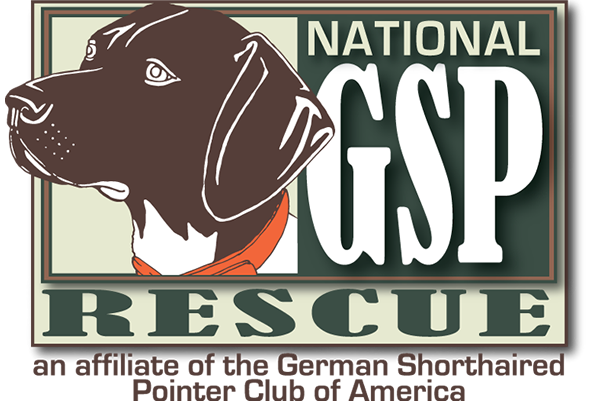 Don’t hesitate to join in the Pet Parade, and share your favorite post with others. Visit one (or all!) of the hosts below, and link up to the parade! 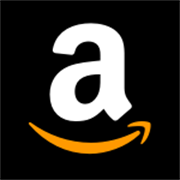 Rascal and Rocco, Basil the Bionic Cat Blog, Love is being owned by a Husky, Barking From the Bayou, and Jan’s Funny Farm. 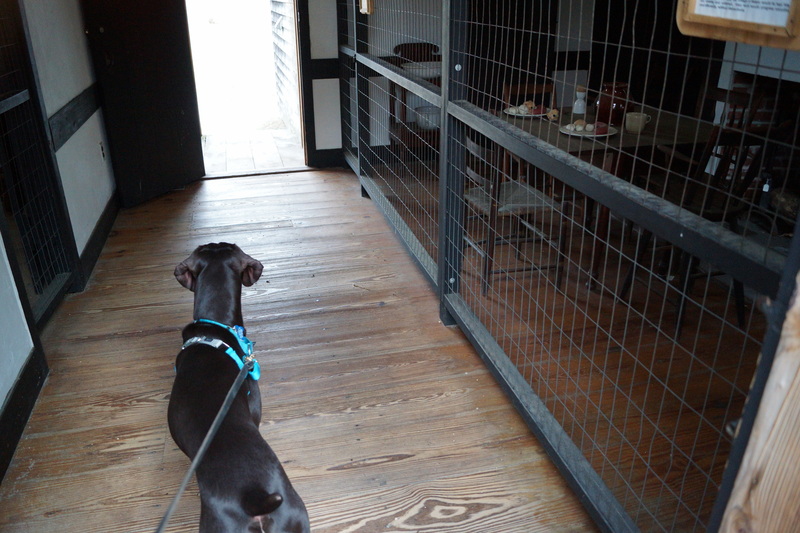 We took Cello and Hooch to historic Batsto Village for a hike! 3) I thank God we didn’t let the man’s opinionated statement divert us from our desire to have GSPs in our family. 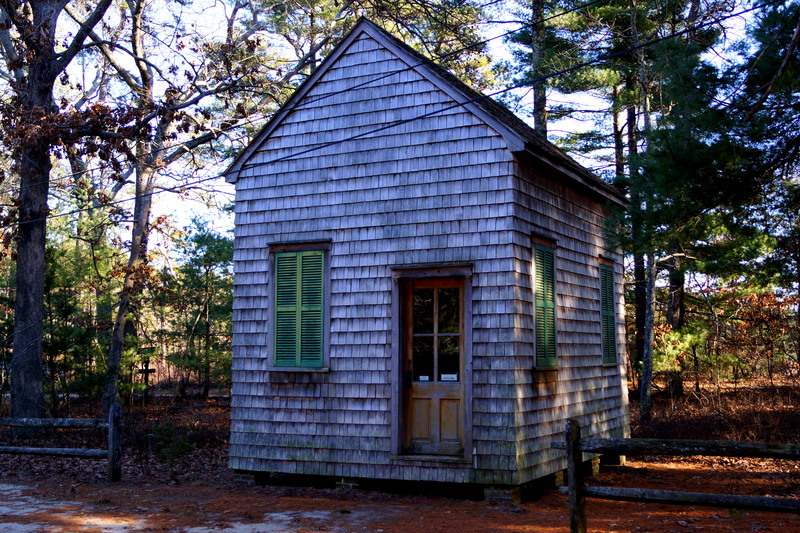 Batsto Village dates back to 1776, and is located in Southern New Jersey in the Wharton State Forrest, New Jersey’s largest state forest, located in the heart of the Pinelands (home of New Jersey’s cultural icon, The Jersey Devil!) Archeologists have found evidence of Prehistoric life in the Batsto area as well…the history dates back several thousand years! 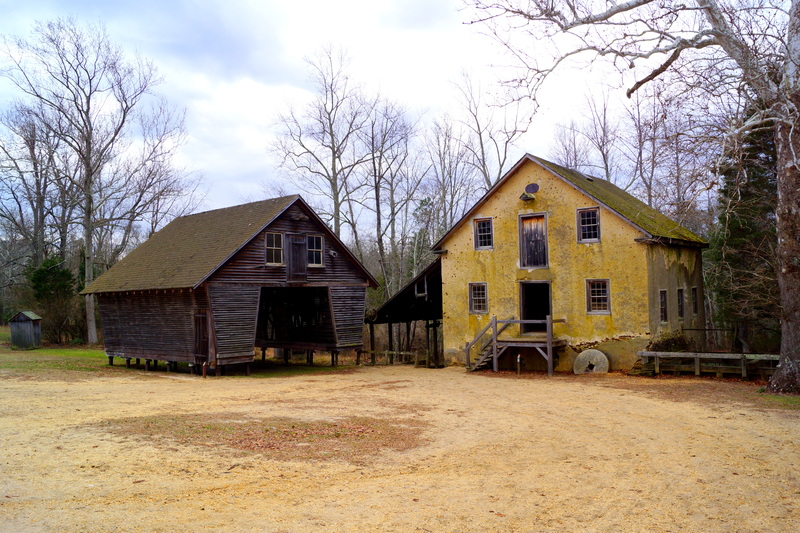 Batsto Iron Works was built along the Batsto River in 1766. Batsto had all the natural resources necessary for making iron: bog ore from the banks of the streams and rivers, wood for fuel, and water for power. The Batsto Iron Works produced household items such as cooking pots and kettles. 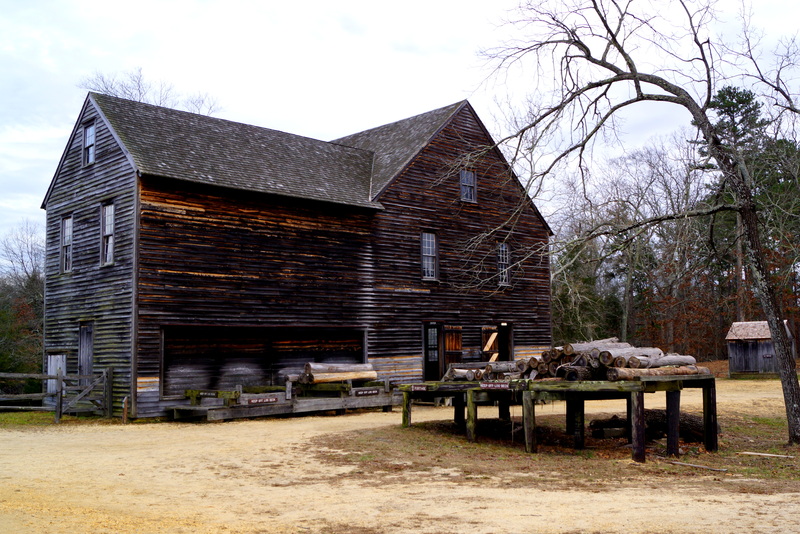 During the Revolutionary War, Batsto also manufactured supplies for the Continental Army. By the mid 1800’s, iron production was down, and Batsto re-invented itself as a glass-making community, specializing in window glass. 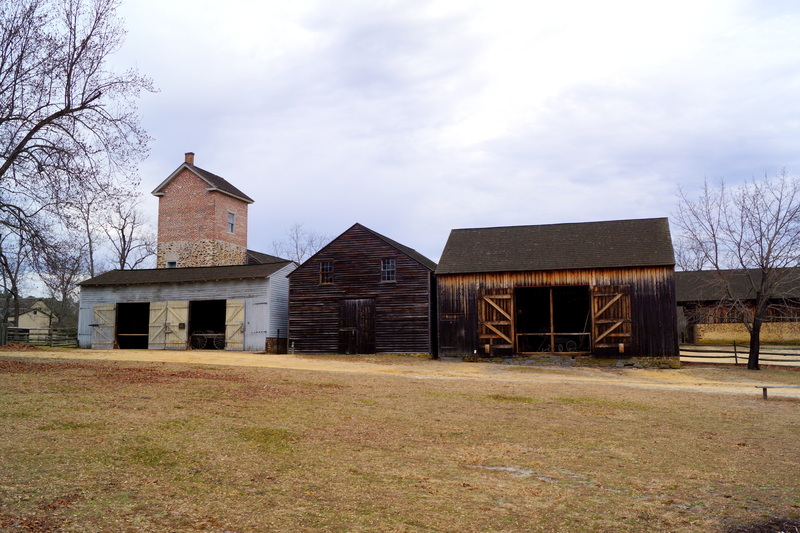 Today Batsto Village is a New Jersey Historic site, and is also listed on the New Jersey and National Registers of Historic Places. 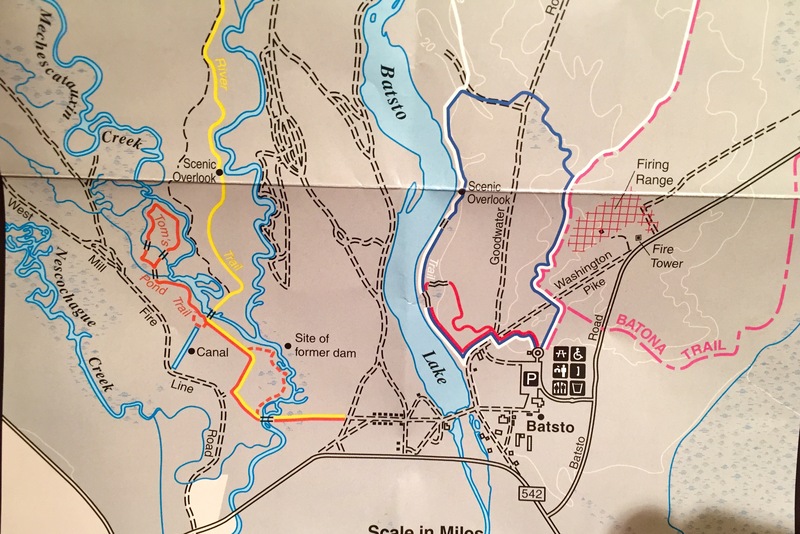 The Batsto area also has numerous hiking trails, some of which connect with the 50-mile long Batona Trail (whose name derives from the words BAck TO NAture). 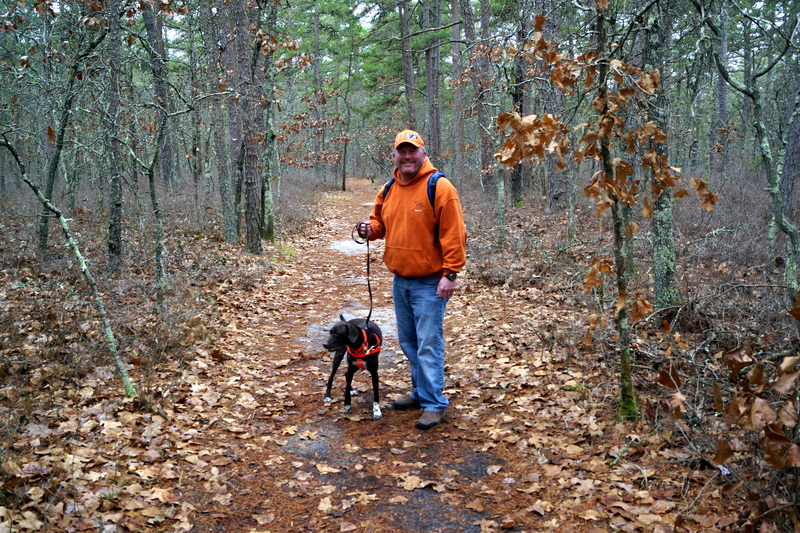 We decided on the orange-blazed Tom’s Pond Trail. 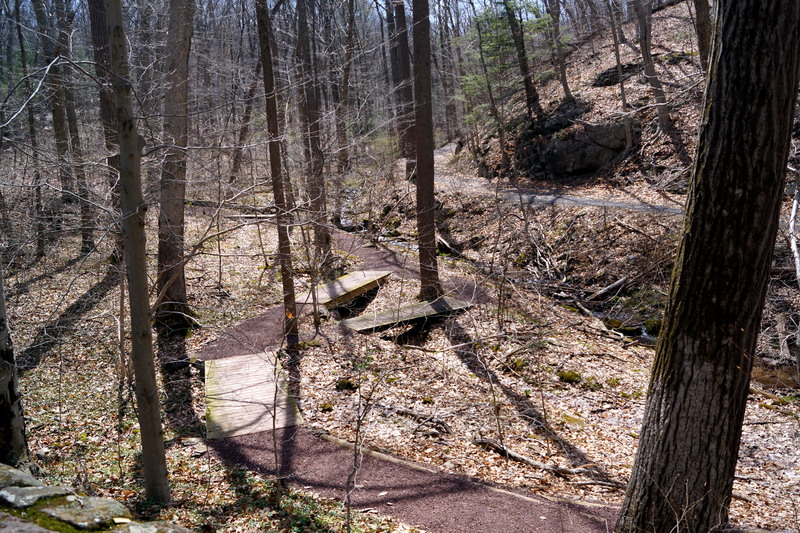 To get to this trail, park in the Visitor Center parking lot. 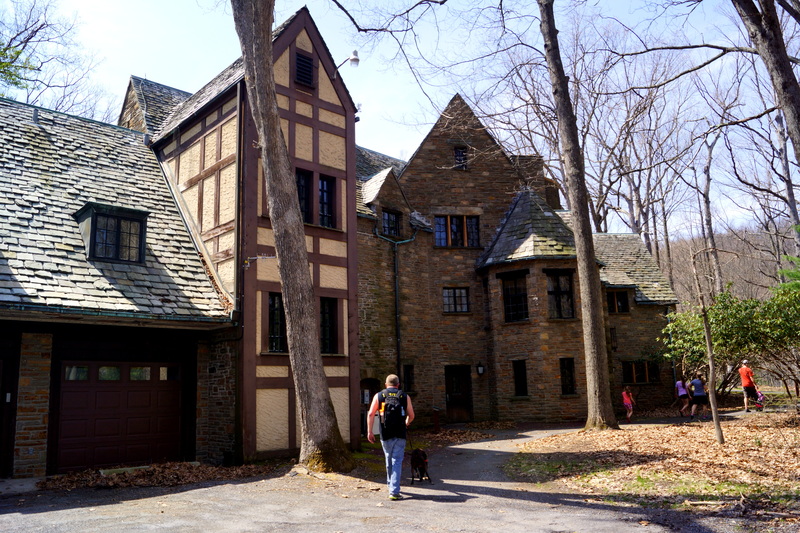 Walk past the Visitor Center, toward the Village and turn right to go past the Mansion, a 32-room home that served as the former residence of generations of ironmasters. 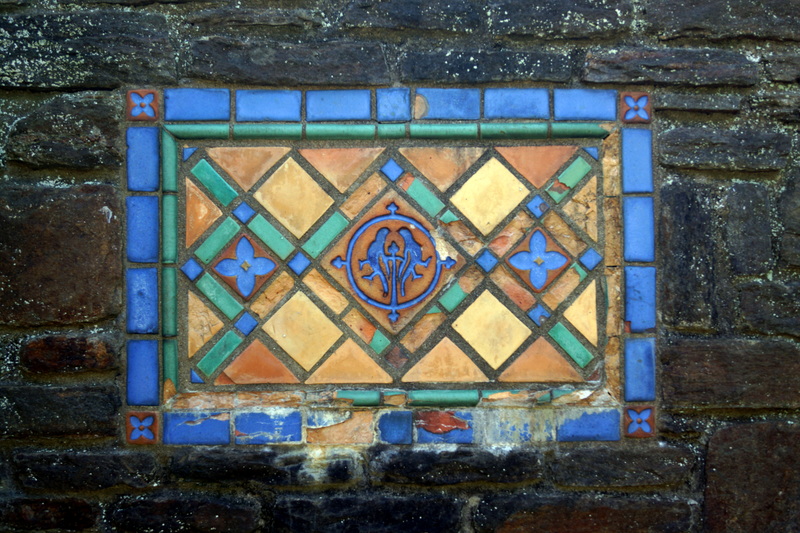 Fourteen rooms, (including the parlors, dining room, library and bedrooms), are open to view for people visiting Batsto. 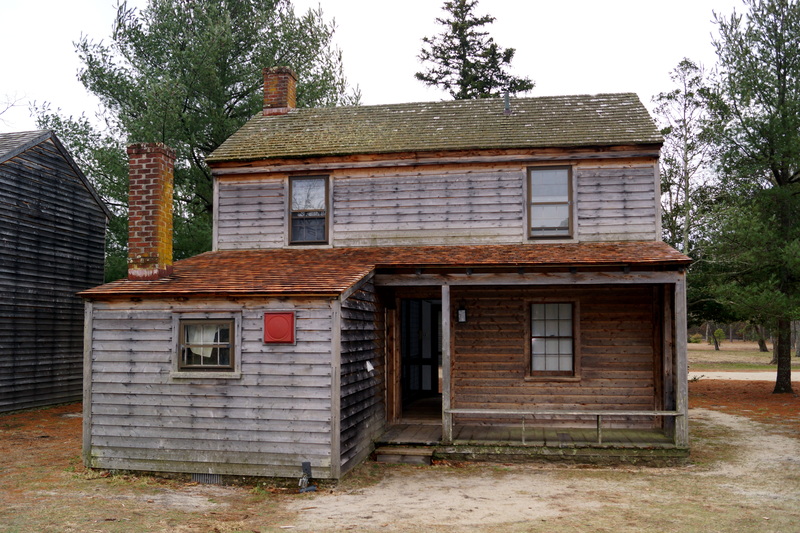 Just beyond the Mansion are many original structures still standing in the Village, including a General Store, Post Office, Gristmill, Sawmill, Blacksmith, Glassworks, Ice House, and the Batsto Church. Other cool things not to pass by are the remains of an ore boat, extracted from the bottom of Batsto Lake, an ore pile, iron furnace, and Farm. The picture below is the Piggery. This structure was used to slaughter hogs to provide food for the Village. The tall stone and brick tower on the left provided water from a large tank, which flowed into a large processing tub where the animal parts were further processed. 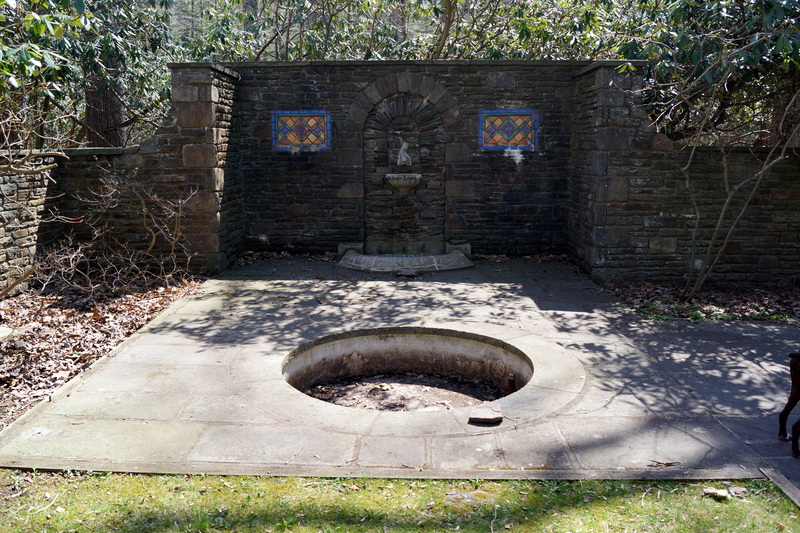 The cast iron tub is thought to have been manufactured by the iron workers in the village. Continue across Batsto Lake on a plank bridge, where you will also see (and hear!) the dam. Just across the dam is the Sawmill, which was powered by Batsto Lake. The mill cut lumber and shingles that were transported by train all over the east coast, providing additional profit for Batsto. Just over the bridge is a great place to sit and take in the views of Batsto Lake. Batsto Lake and River were the major reasons for the location of the Village and its Iron Furnace. 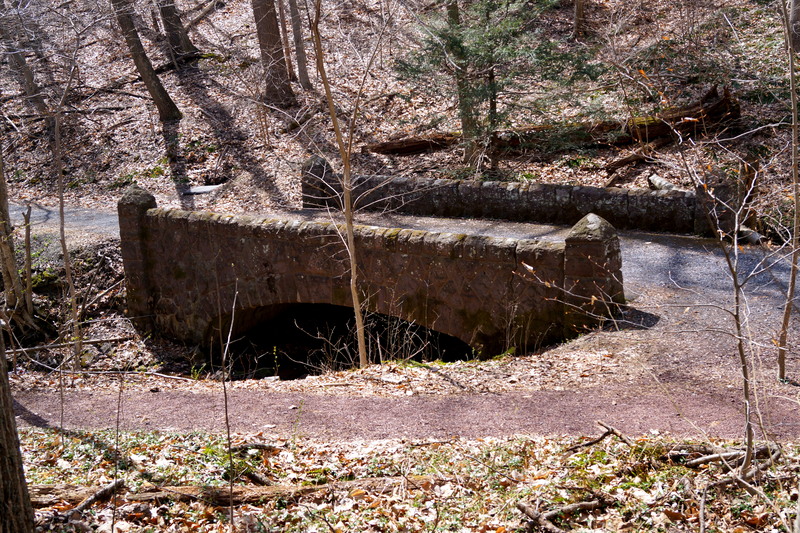 The river provided bog ore, and the lake was produced by the dam which allowed boats to move the bog ore from the river to the Iron Furnace. The lake also provided water power for both the Sawmill and the Gristmill. The sandy trail then leads through a row of homes once inhabited by the employees of Batsto. The state of New Jersey purchased the Batsto area in the mid 1950’s. At this time, there were still a few people living in the Village houses, and they were told that they were allowed to remain living there for as long as they wanted. It wasn’t until 1989 that the last house was vacated! People emplyed at Batsto lived in cottages consisting of 2- 3 rooms downstairs, and 2-3 rooms upstairs. 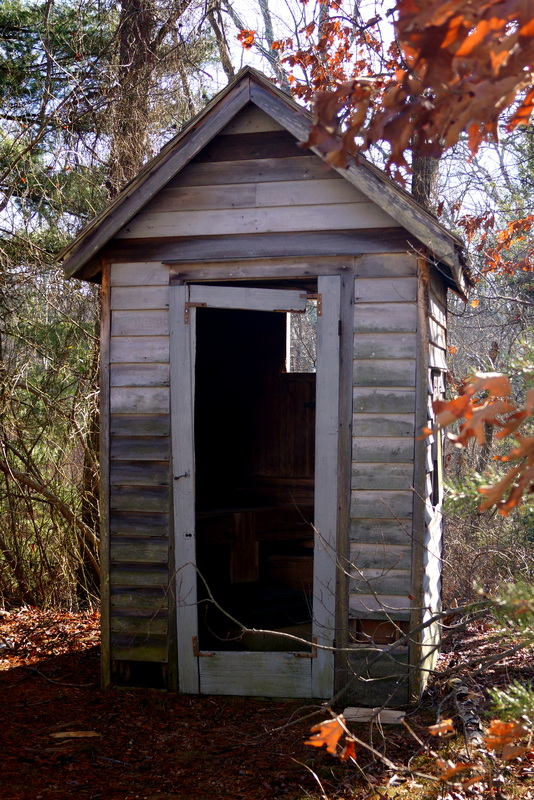 Each house had an attic, fireplace, and an outhouse. 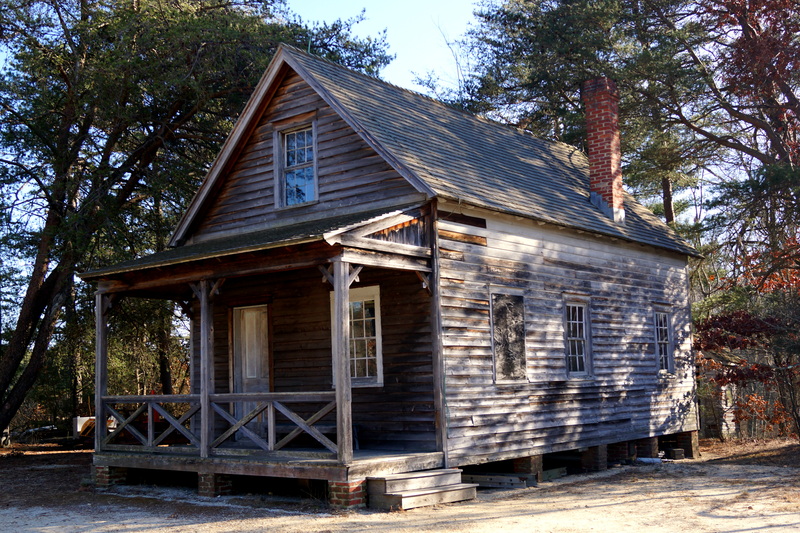 Several homes are open for visitors to walk through. 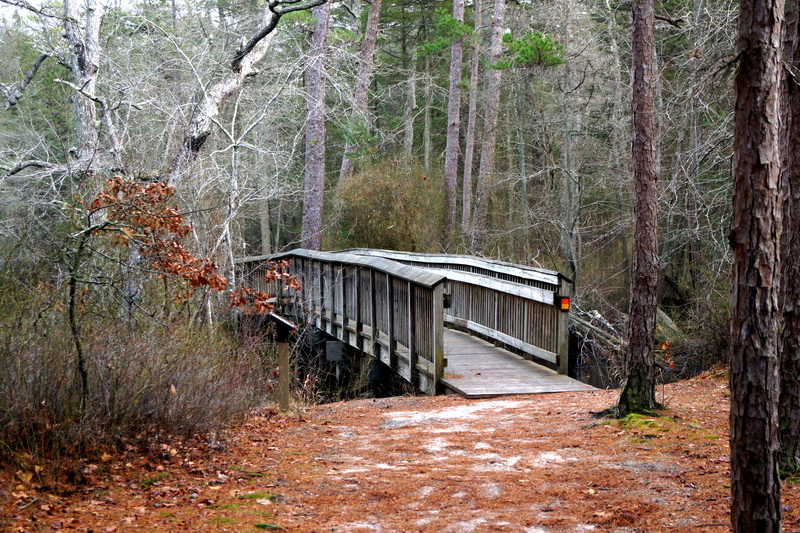 Once past the cottage-style homes, a path leading to the orange-blazed Tom’s Pond Trail and the yellow-blazed Mullica River Trail is set diagonally off to the right. 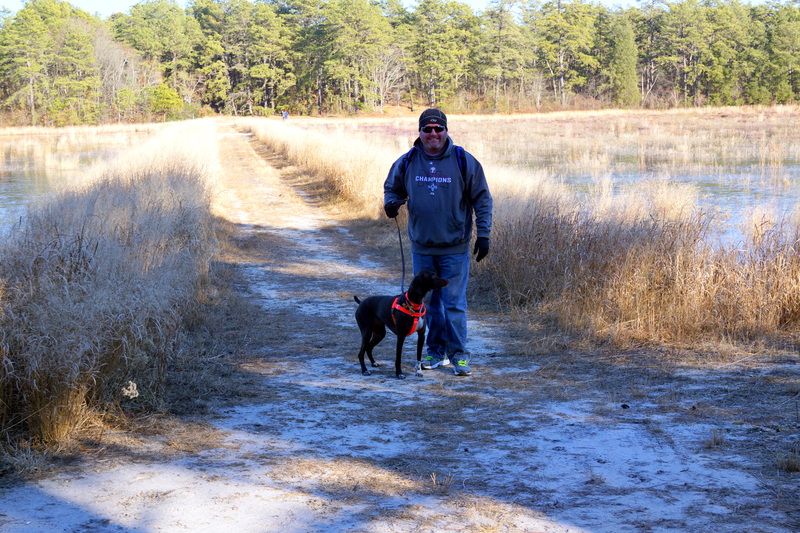 You can pick up the yellow-blazed Mullica River Trail along the way, but we decided to stick with just the orange-blazed Tom’s Pond Trail. There were several foot bridges we crossed along the way. Hooch did a great job keeping up! The orange-blazed trail is very well marked. The path follows along the Sleeper Branch of the Mullica River, then loops around for your return trip to the starting point. 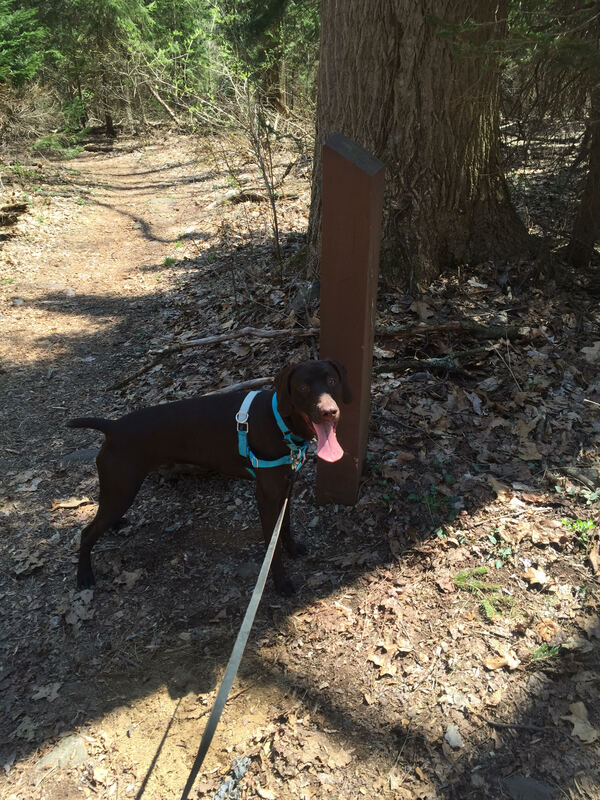 Not bad for Hooch’s first hike! 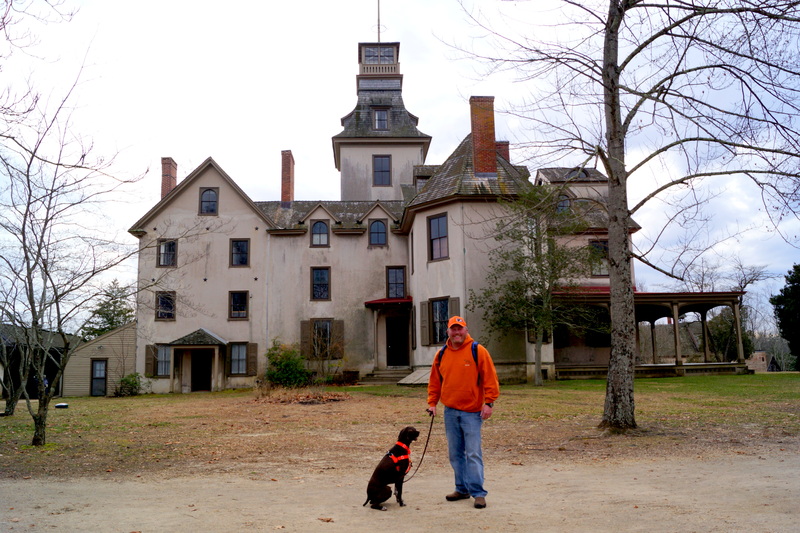 In addition to the historic buildings and hiking paths, Batsto hosts many events and tours. 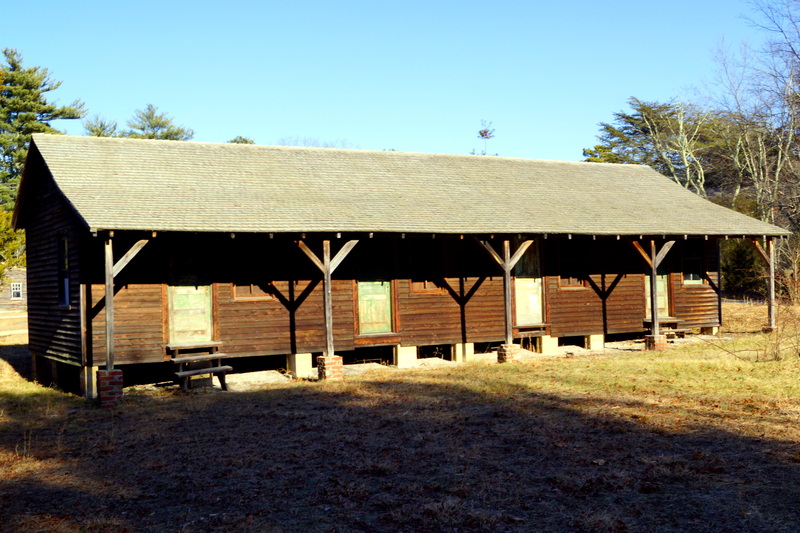 Camping and Canoeing are also popular at this historic site. 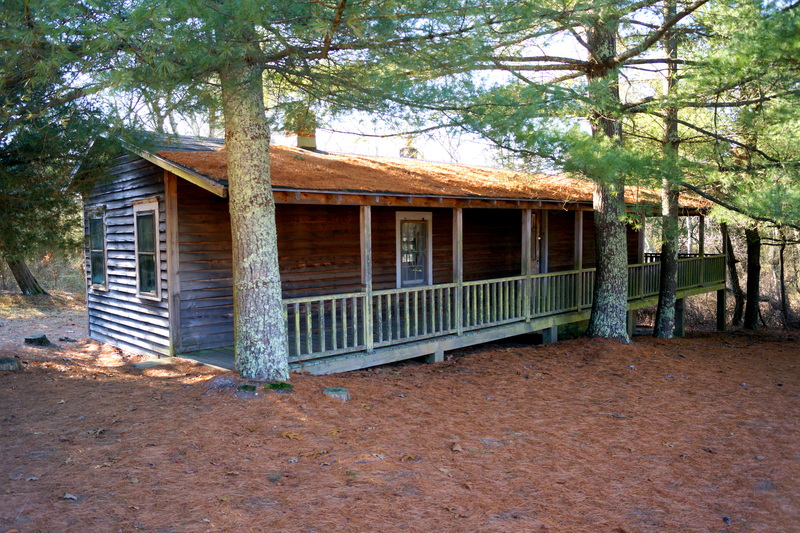 Other amenities include a park office, restrooms, telephone, water, and picnic area.